MRSA is a germ that lives on the skin and in the nose. An untreated MRSA infection can become very serious. MRSA usually starts as a bump on the skin. It can be red, full of pus, warm, painful, or swollen, and may look like a spider bite. Contact a nurse or doctor right away. Don’t touch or pop the sore. Don’t touch the pus or drain it yourself. Cover the sore with a bandage. 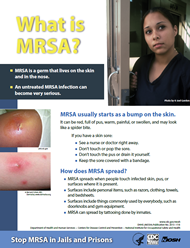 MRSA spreads when people touch infected skin, pus, or surfaces where it is present. Surfaces include personal items, such as razors, clothing, towels, and bedsheets. Surfaces include things commonly used by everybody, such as doorknobs and gym equipment. MRSA can spread by tattooing done by inmates.